Spoilers: Mild for Mistress of Rome; there are also some things which are not spoilers if you know your Roman history, but which would be spoilers if you don’t, say, know what Emperors come in what order. A sequel to Mistress of Rome (and, less directly, Daughters of Rome), Empress of the Seven Hills follows the fortunes of Vibia Sabina, daughter of a noble senator and a selfish spoiled aristocrat, and Vix, son of a barbarian chieftain and a Jewish slave, as their lives intersect and become inextricably entangled with the Emperors Trajan and Hadrian. Vix, feeling stifled by the smallness of life in Brigantia, heads back to Rome, initially taking work in the household of Marcus Norbanus, whom he knows for a good man. The little daughter of the household that he remembered has grown up into a complex and fascinating woman, forthright and unyielding, determined to take charge of her own destiny. They have an affair, but when she decides to marry Hadrian — the Emperor Trajan’s ward, though not yet his heir — trouble arises and they part ways. Vix joins the legions, aiming to be a great general someday. Sabina uses Hadrian as a way to get out and see the world. The reader then follows Vix on campaign, where he becomes more acquainted with another of Sabina’s suitors, a young bookworm named Titus (a treat of a character if you know your history, but I’ll keep mum for those who may not). Vix takes up with a local girl in their fort town, who has a young son named Antinous (more historical foreshadowing), and the reader gets to enjoy a lot of the ins and outs of life in the Roman legion. Vix and Sabina collide again when Hadrian comes to serve as legate for Vix’s legion, and their interactions (and the repercussions of those actions) drive a lot of the story as it moves from Germania to Dacia to Parthia. Vix’s and Hadrian’s competing ambitions also fuel conflict; Emperor Trajan thinks highly of Vix and starts pushing him up the ranks, which Hadrian (and his ambitious sort-of-adoptive-mother Plotina) resent. There are some problems in this book. Quinn continues to use shifting points-of-view in odd and somewhat inexplicable ways. I couldn’t tell you why Vix is written in the first person and everyone else is in the third; it makes very little difference, as we get plenty of introspection from the other characters whose narratives are in third-person. There’s also a gender issue with the viewpoints that it took me a day or so to figure out why it was troubling me: Quinn only ever lets us see Sabina, her heroine, when she’s in the same vicinity as the primary male characters. We almost never get Sabina on her own, really. She tells us that she travels, that she sees amazing things, that she works hard to better the lives of common people… but Quinn never lets us see that. We just hear about it after the fact. Whereas she trusts her male characters to hold our attention on their own: we see Vix with the legions and Titus on campaign and in Rome, but we never see Sabina having those adventures that we’re told are so critical to her. It’s a little troubling. I would have loved to have followed Sabina on her travels, to have experienced the broadening world along with her. Instead, I feel cheated. There are also, as there were in the other two books, issues of historical inaccuracy. This still sort of bewilders me; Quinn has clearly Done The Research in so many aspects, and yet there are things she states as facts which just plain aren’t. These aren’t the items of authorial license — I’m not talking about shifting timelines around or condensing families. That sort of thing, I have no trouble with; authors have to do things like that in service of the story. I have trouble when people get social history blatantly wrong. It’s her perennial insistence that a gladiator died in every match (nonsense; they were too expensive to waste like that). Or when she claims that patricians and plebeians couldn’t intermarry (true in the earliest days of the Republic; false after 445 BC — almost 600 years before this book takes place). Probably these things wouldn’t be jarring to everyone, but since I’m sure a substantial part of her audience consists of classicists, it’s also probably not just me. This book, though a sequel, doesn’t seem as strongly connected to the previous book as it ought to be. I didn’t read Mistress of Rome that terribly long ago, but details were escaping me, and Quinn never retreads that ground quite thoroughly enough. I think anyone coming to this book without having read Mistress of Rome at all would be a little lost, particularly with regards to Sabina’s and Vix’s parentage and why it matters. She also withholds the character list until the end of the book, which seems a bit odd to me (though that may, I credit, have been an editor’s or publisher’s choice). And yet, despite those problems… it’s compelling. Quinn does something that’s actually pretty difficult: she gets you tremendously engaged with characters who are not always (or even often) likeable people. Sabina is a little too cool and calculating, and while it makes her fascinating, it also makes her difficult to empathise with. Vix is exactly the opposite: hot-headed and impulsive past the point where it would be charming, and borderline abusive at times. But I got wrapped up in them anyway. It’s part plot and part dialogue, I think; Quinn definitely has the knack for crafting voices, and that can go a long ways towards enlivening a character. The plot clips along through interesting times and political complexities. I want to know how they’re going to end up where they’re obviously going, and how they feel about it along the way. Similar to Marcella in Daughters of Rome, Sabina strikes out for what she thinks she wants, and then finds out that the reality is less malleable to her will. Still, there’s something charming about her unconventional affectations, and something pitiable as she gets in over her head. Vix is a little bit tougher for me. I can tell I’m meant to love him, despite his all-too-obvious flaws — and yet there’s always something that gets in the way of it. His fury with Sabina is entirely disproportional to her supposed crimes against him, and it underscores his narrow ability to comprehend the world outside of his own head — not a trait I find attractive. He makes no attempt even to understand where Sabina’s coming from; he mostly just throws temper tantrums and storms out when she tries to explain that she’s acting in, really, the only way she can. She pushes the parameters of what her society allows in a woman, but that’s still not good enough for him, and he behaves pretty poorly as a result. He starts getting better (read: less of a total jerk) towards the end of the book, however, and I’ll be interested to see if his arc continues in that fashion, even as circumstances turn against him, as they seem sure to. He’s certainly an interesting character, but I can’t quite fall in love with him the way the book seems to expect me to (and I’m generally quite well-inclined towards the brash soldier archetype). And there is something compelling in their love story which goes beyond the mere attraction of opposites, in the way that they keep colliding into each other, even when they don’t mean to, even when they deliberately try not to. There’s a force behind it all, something tinging of destiny, and that does lend them some star-cross’d appeal. There are quite likeable characters, though they get less screen time: Emperor Trajan is a personality you just can’t help but smile at, and then Titus and Sabina’s baby sister Faustina are both pretty great. For all Titus’s protestations that he’s a dull plodder, he’s a character with wonderful insight into the situations and people around him, and his steadiness is a necessary balance between the other extremes. Another thoroughly unlikeable character isn’t meant to be likeable: Plotina is a terrific villainess, particularly as Quinn draws us along as she progresses from just a typical overbearing mother-in-law type to a truly corrupt tyrant descending into real madness. Her son-in-law Hadrian, definitely an antagonist, is complex: he wants to be well-regarded and to be a popular and effective leader, but he is all too aware that he is just plain not a good person. He’s violent, selfish, and cruel — but also desperate for approval. Watching him keep all of that in check is an interesting ride, and I sometimes wish saw him through less biased perspectives — Vix and Sabina, who hate him, and Plotina, who idolises him, don’t precisely give the reader the fullest view of the character, as they are all unreliable narrators where he is concerned. 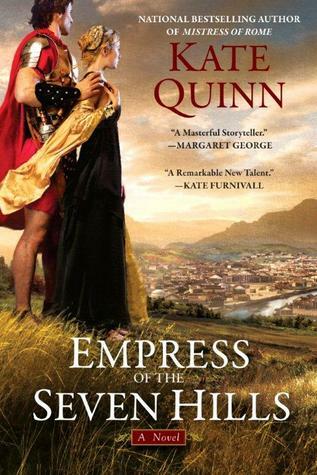 Overall, Empress of the Seven Hills is a solid entry into the genre of Roman historical fiction. Quinn paints a thorough picture of an under-examined period of history, and tackling it from characters of varying status and background allows her the room to really explore the details and nuances. I anticipate a sequel; the book ends with Vix literally informing the reader “But I’ll tell you that later,” so I can’t imagine Quinn isn’t going to continue the story. These books lack the epic scope and deft hand of the Masters of Rome series, but they’re still perfectly enjoyable. This collection has some really great stories, and some that I find rather unengaging. As with Dream Country, there’s really no through-line here, so it’s probably best to take each story individually. Three Septembers and a January – I love this story to bits. It is the true tale of one of history’s quirks, Joshua Abraham Norton, the First Emperor of the United States from 1859 until his death in 1880. As Joshua is contemplating suicide, Despair tempts her older brother Dream into a bet: to see if Dream can claim and keep him, rescuing him from Despair, without his falling into Desire or Delirium. Against his better judgment, Dream takes the bet, and gives Joshua a dream of being Emperor — and so he becomes. What follows is an incredibly charming story of how he sets himself up in imperial majesty, never mind his actual poverty. He becomes a beloved local celebrity in San Francisco, cherished for his eccentricities, protected from persecution, selfless and benevolent in all his dealings. Desire cannot tempt him, and as Delirium notes, “His madness keeps him sane.” The best thing about this story is that, as I said, it is entirely true — or, given that (as we learned several volume ago) things need not have happened to be true, I should better say — it happened, it is historical reality, well-documented. It’s a wonderful inspiration, a testament to the power of a dream to sustain a life, to keep someone going. Cocooned in his perfectly sane madness, Emperor Norton is inviolable. Thermidor – Lady Johanna Constantine, who we met back in Hob Gadling’s origin story, is on a mission from Morpheus in the fading days of the Reign of Terror. An Englishwoman, undercover in Paris, steals the head of Orpheus, the Dreamlord’s son (the head, incidentally, is still alive and talking, which we’ll learn more about later) and take it to safety. Robespierre, we learn, seeks to destroy the head, as he seeks to destroy everything he dismisses as superstition, sacrificed to the altar of Reason. The story progresses through several philosophical tangents, exploring the nature of liberty, the double-edged sword of revolution, and the place that the mystical and the impossible have in a post-Enlightenment world (a thread which the series will pick up again later). I like this story a lot, largely for that mix of historical reality and the fantasy of the Dreamworld. I also loved seeing Johanna Constantine in action, and I always wished she would have become a more regularly featured character. The Hunt – In the modern age, a grandfather tells his reluctant granddaughter a story of their people. In the Old Country, a young man named Vassily meets a gypsy woman, who in exchange for dinner gives him a chain with a picture of a beautiful duke’s daughter on it, and he decides to set out in search of her. From there, it becomes largely an Eastern European/Russian fairy tale — with a couple of notable diversions. For one thing, the thin veil over the story is that “the people” are werewolves. For another, Vassily runs into Lucien, Dream’s librarian, who has misplaced a book that has fallen into Vassily’s hands — and thus, when Vassily most needs assistance, Lucien becomes the unlikely fairy godmother to help him out of trouble. August – Late in the reign of Emperor Augustus, formerly mere Caius Octavius, the emperor disguises himself as a beggar for a day and discusses the world he rules with an actor named Lycius. I really enjoy this story in some ways, and it irritates me in others. It’s incredibly inactive — most of the panels are Augustus and Lycius just sitting on a stoop, talking. Some of the history is good, but a lot of it is completely wrong, the stuff of popular misconceptions about Roman society. I don’t know whether I’m disappointed in Gaiman for shoddy research, when he’s usually so precise about it, or if I should let it slide on the basis of this being 20 years old and thus an entire generation of scholarship behind. The most interesting part is the explanation of why Augustus set the boundaries of the Roman empire where he did — and, historically, the Empire’s swift decline began when they over-extended themselves. By Gaiman’s account, this had to do with a prophecy, that Rome would either flame and sputter for a few hundred years, or else spread to the ends of the earth and rule for ten thousand years. (Personally, I’d give quite a lot to see a graphic novel series on that version of history). Overall, this one somehow falls flat for me, which is odd, since the material should’ve been a gimme. Soft Places – A young Marco Polo gets lost in a desert sandstorm and finds himself stumbling through the veils of time and reality, meeting with people from the past and the future, as well as our old friend Fiddler’s Green. I like the inherent concept behind this one — the very idea of “soft places” where reality thins, time bends, and the mystical collides with the mundane — but somehow this is an issue that never sticks with me. Somehow the characters just don’t reach out and grab, and while the art pretty perfectly reflects the story, that also means it ends up a whitewash in my mind. So, Soft Places is effective in weird ways, but not one of my favourites from this volume. Orpheus – This is a good if not particularly inventive retelling of the myth of Orpheus, the musician whose bride dies on their wedding day, who goes to the Underworld to find her, only to lose her through his own lack of faith before he reaches the realm of the living again. The best thing about this storyline, which spans several issues, is the integration of the Endless into the tale. Orpheus is, in this version of the tale, the son of Calliope and Morpheus — an interesting twist, since most versions put him as the son of Calliope and Apollo, and in “August”, Augusts mistakes Morpheus for Apollo. That’s one of those little ways Gaiman twines his stories together, that you might not appreciate on the first or even the fifth read, but which curls there, underneath, waiting for you to notice it. Anyway — we meet, for the first time, the entire family of the Endless gathered for Orpheus’s wedding to Eurydice, including the missing prodigal, here called only Olethros — which translates as “Destruction”. When Eurydice dies, as in the myth, Orpheus wants to go to the Underworld for her; here, the decision involves the Endless. Dream initially refuses to help, and father and son quarrel, but Uncle Destruction sends Orpheus to talk to Death — who says the way to get in and out of the Underworld alive is for her to agree not to perform her function on him. The myth progresses as we know it, all the way through the less-often-told story of Bacchantes tearing him to pieces (in a few rather gruesomely detailed pages) and his still-sentient head floating down the river. The Parliament of Rooks – Another one that fails to impress me. Of all the elements of the Dreamworld, the Eve-Cain-Abel part always seemed weird and out of place to me. They always seem like they’ve come in from a very different kind of storytelling, and so I never much enjoy their presence. The best note in this story is Eve’s tale of the three wives of Adam, from the Jewish apocrypha. Ramadan – This story has some of the best art in the series, though I find the tale itself somewhat lacking. The sultan of Baghdad believes that he is living in the most glorious city in the most glorious time ever created, and he strikes a deal with Morpheus to keep it so forever, in the Dreamworld. And so Morpheus locks the city in a magic ball, removing its glory from the real world but preserving it forever in fantasy. The story ends in what was then modern Baghdad, in 1993 — eerily similar to what is modern Baghdad in 2012, war-ravaged and destitute, but still a place where a young boy might dream of a golden past. Overall, there’s a lot in this volume about the place where dreams and the mundane world collide, and that’s a theme I really enjoy. There are also a lot of threads, less pronounced, about family, other relationships, and their value. From Vassily’s choice to prize a soulmate above wealth and carnal delights, to Augustus’s pronounced familial disappointments, to the amazing love that wraps Emperor Norton, to, of course, the tangled web of the Endless. It centers, ultimately, on Morpheus’s fraught relationship with his son. Orpheus disowns him in a moment of despair, and unyielding Morpheus refuses to reconcile even after tragedy befalls his son. If you know where the story’s headed, you can feel what it’s beginning to spin to in this volume, as certain aspects of the story pick up more energy and as more information falls into place. 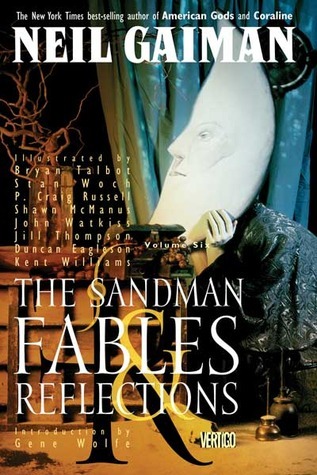 Fables and Reflections is thus oddly situated between plot-advancing and ponderous, displaying both the overall arc of the series and the imaginative exploration at which Gaiman excels. I’ve been wanting to immerse myself in some delightful Roman fiction lately, and Daughters of Rome was just what I’d been hoping for. It’s a prequel, sort of, to Quinn’s Mistress of Rome , which I read last year and which made only a mediocre impression on me. Daughters of Rome is a big, big improvement. Quinn has figured out how to wrangle multiple viewpoints without jarring the reader. Daughters of Rome tells the story of the Year of the Four Emperors (69 AD) from the viewpoint of the four Corneliae women — officially Cornelia Prima, Secunda, Tertia, and Quarta, but informally Cornelia, Marcella, Lollia, and Diana. Cornelia is married to Piso, a Senator that all of Rome assumes will be tapped as heir to the imperial throne — and she’s excited about that. She has her eye on being Empress, but her joy in that possibility is troubled by her apparent inability to conceive a child, even after 8 years of marriage. Marcella, Cornelia’s younger sister, is stuck in a completely loveless marriage with Lucius Aelius Lamia, a politician who spends most of his time abroad. Marcella fills her hours with writing histories of Rome, much to the dismay of her relatives. Their cousin Lollia is on her third husband at the beginning of the book, as her slave-born grandfather whirls her around for political advantage. She bears up cheerfully, however, taking lovers as it suits her and generally making the best of circumstances. Diana, another cousin and youngest of the four, has no time for men or politics; she’s horse-mad and has no thoughts for anything but the chariot races and the victory of her precious Reds. They’re four completely different women, but devoted to each other. The book whirls through the Four Emperors, but keeps its focus tightly on the four women. We see the change from Galba to Otho to Vitellius to Vespasian through their eyes, and even if you know the history of the politics, the twists and turns of the book remain surprising, because it’s not really about the political facts — it’s entirely about the four female lives. Of the four, only Cornelia and Marcella are real historical characters (though all of Lollia’s husbands were real, and Diana serves as a perfect representative for all Romans who were obsessed with the races), and Cornelia doesn’t make much of a mark on history, disappearing into domestic obscurity. Quinn grafts historical fact and imaginative speculation together beautifully, immersing the reader in life in Imperial Rome. There are still just a couple of small inaccuracies, fewer and smaller than in Mistress of Rome, but which still perplex me, since Quinn clearly Has Done the Research. Overall, though, the experience is entirely transporting. What I really enjoyed about this book was the way that Quinn subverted my expectations about the characters. When I began, I thought I knew who our protagonist was. Among the prude, the flibbertigibbet, and the sports fan, of course my sympathies would lie with the writer — with clever, subtle Marcella. After all, that’s the sort of character who’s usually the reader avatar in any historical novel. Just ask any romance fan — we like bluestockings, women who challenge ideas about literacy and intelligence. That’s who we’re supposed to glom onto. Except, in Daughters of Rome, the characters are all dynamic, and wonderfully so. The turmoil of the year transforms Cornelia from a straight-laced, ice-cold matron to a warm, exuberant woman. Lollia, troubled when life becomes too serious for her liking, learns to value real love and her family over fleeting pleasures and casual affairs. Even Diana, who is the flattest of the four characters (Marcella at one point thinks of her as the least interesting girl in Rome, and I’m not sure she’d be wrong), grows into herself by the end, proving her worth and demonstrating that she’s not quite as thick as everyone assumes. Marcella, though, becomes so much less sympathetic as the book goes on — and I find that fascinating. She’s smug and secretive, and as a reader, you share Cornelia’s and Lollia’s frustration with her increasing self-absorption. It’s hard to feel sorry for her at the end (and it took me a while to realize just who she was and what would become of her, since Quinn changes her name from the historical record), because she brings it entirely on herself with her scheming. 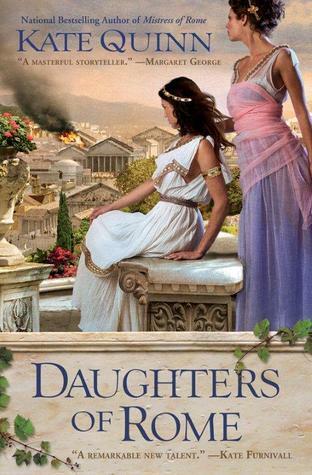 Daughters of Rome is thoroughly enjoyable historical fiction, especially for anyone looking for something a little non-standard within that genre. The turmoil of this time period is prime fodder for political and personal intrigues, and Quinn plays them to the hilt. Highly recommended.